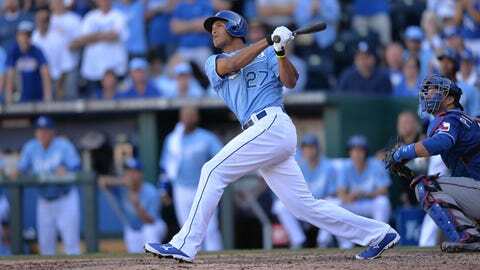 What a way to end the Royals' 2013 home season -- a walk-off grand slam by Justin Maxwell. KANSAS CITY, Mo. — Just in case you have a little free time while celebrating Christmas Eve, FOX Sports Kansas City is airing replays of four of the most exciting games of the Royals’ 2013 season. It’s a fantastic idea for fans wanting to relive some of the thrills from this past season, and though the Royals came up short in their playoff quest, 2013 was, without question, the most exhilarating season here in 10 years. May 30 was a dreary, rainy Thursday in Kansas City; plenty of Royals fans were on the verge of pitching the entire season. Some fans already had. The Royals were in the midst of a horrible slump, having lost eight straight games and 12 of 13. And starting with a heartbreaking 2-1 extra-inning loss to Chicago on May 6 at Kauffman Stadium, the Royals were still mired in an overall 19-of-23 funk. A once-promising season — the Royals had enjoyed being in first place for 15 days in April and early May — had turned to waste. But help was on its way. On that Thursday, general manager Dayton Moore drove from Kansas City to St. Louis to join the team. Moore had a unique passenger with him — George Brett. The night before, Moore had reassigned hitting coaches Jack Maloof and Andre David, and hired Brett and Pedro Grifol as their replacements. It was on this day that the Royals’ season began to turn around, and it started with a dramatic comeback against the Cardinals. Trailing 2-1 in the ninth, Jeff Francoeur smoked a tying home run to left field. And later in the inning, Eric Hosmer bounced a two-run double to right to give the Royals the lead. That’s when the drama truly began. It had been a rainy night in St. Louis, and the field was drenched. Then the rain intensified in the ninth inning. Finally, after Hosmer’s double, the umpiring crew had no choice but to bring on the tarp as puddles formed on the infield dirt. Baseball rules stipulated that if the game were to be called at that point, the score would revert to what it had been through eight complete innings. That would have wiped out the Royals’ ninth inning and given the Cardinals a 2-1 win. For a team struggling so hard to get wins at that point, having one taken away would have been devastating. But this is where crew chief Joe West became a hero to Kansas Citians. He knew this was the Royals’ only trip to St. Louis, so he instructed his crew to wait the rain out. And wait they did. They waited for hours and hours. The game didn’t resume until after 3 a.m.
And those of us who stayed up that night and morning can still recall the sight of Royals players actually trying to help the grounds crew with rakes and sand. The Cardinals’ ground crew, reluctant and dragging its collective feet, seemed to think that if it waited long enough, more rain would come and West would have to call the game. But West wouldn’t have it, and pretty much instructed the grounds crew that he would wait all morning if he had to. Finally, the grounds crew got the field playable, play resumed, and the Royals hung on for a much-needed win. And with Brett in the dugout, the Royals’ season slowly began to turn around. After a bit of a resurgence in June, the Royals began to slip again, having lost five of six at this point, including a distressing 4-3 game to the Braves the night before in the first game of a two-game set. Desperate again to stop a slide, the Royals jumped the Braves early and forged a 3-0 lead. Alex Gordon led off the Royals’ first inning with a home run. Starter Luis Mendoza was cruising through six shutout innings as well until he began to wobble in the seventh. And that’s when the Royals’ bullpen caved in. Bruce Chen gave up an RBI single and a walk. Then Luke Hochevar surrendered a two-run single that tied it. But the Royals would not be denied. David Lough led off the bottom of the 10th with a single to center. Miguel Tejada bunted him to second, and Gordon responded again with a slap single to left field that plated Lough for the win, initiating a wondrous walk-off celebration at home plate. This dramatic win became symbolic of the Royals’ post-break surge, and was near the beginning of a tear in which the Royals won 19 of 24. On this night at Kauffman Stadium, the Royals, who earlier this season rarely found a way to overcome deficits, found a way. Ervin Santana was brilliant, allowing just one earned run through eight innings. The Royals jumped ahead 1-0 in the first on an Eric Hosmer bomb to right field. But the Orioles answered after an error by Hosmer, and Matt Wieters’ two-run homer in the fourth gave the O’s the lead. The Orioles added another run later to take a 3-1 lead. Then came the dramatics. Lorenzo Cain singled with one out in the eighth, and Hosmer delivered again, a monster shot over the right-center-field wall that tied it at 3-3. In the ninth, after David Lough reached on a one-out single, Alcides Escobar, of all people, smoked a deep drive to left-center field. Escobar thought he had hit a walk-off home run, and he stopped at the plate to watch it. Fortunately, Lough didn’t watch, and he raced around second base before stopping to see if the ball would be caught. The ball then caromed off the left-field wall and Lough scored the game winner. Few fans will ever forget this dramatic win. Though the Royals’ slim playoff chances had diminished greatly the night before with a demoralizing loss to Matt Garza and the Rangers, the Royals did bounce back for a thriller in the final home game of the season. The Royals’ anemic offense, an issue all season, had scored just three runs in the previous two games. And on this sunny Sunday afternoon, the offense did nothing for nine innings, wasting an eight-inning shutout performance from James Shields. Finally, in the 10th, Eric Hosmer led off with a double. In came former Royals closer Joakim Soria, who intentionally walked Billy Butler. Sal Perez followed with a single to deep short, loading the bases. But Mike Moustakas fouled out. Then George Kottaras grounded to second, and the Rangers got a force at home. At that point, fans wondered: Would the Royals really waste a bases-loaded, no-out situation? The drama continued as Justin Maxwell worked the count full against Soria — one more ball by Soria and the Royals would win. But Soria challenged Maxwell with a belt-high fastball. Maxwell turned on it, sending a tremendous blast over the left-field bullpen for a walk-off grand slam. Maxwell knew it was gone when he hit â he took two steps and raised his arms triumphantly. And then, of course, there was a mob scene at home plate after Maxwell circled the bases. It was quite a sendoff to the fans and the 2013 home season.